Average one checklist per day! Be it your backyard, your wait at the bus stop, your walk with the dog, or the Dry Tortugas...your bird observations can be from anywhere at any time. Just do your best to average submitting at least one eBird checklist per day. Yes, its true. eBirders are better than plain ol' ordinary birders. If the truth hurts and you're asking "Why should I use eBird? Well then click here. 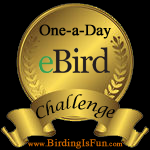 If you are willing to take this challenge, please feel free to place the official "One-a-Day eBird Challenge Medallion" on your website or blog. If you do, let me know and I'll add you to the list below. DISCLOSURE: This challenge is not from the official eBird team, nor from its sponsoring organizations. It's just from me, an enthusiastic eBirder!